Yesterday was a rough, but interesting day for me in Eve Online. It started while pricing out how much it would cost to build a Retriever Mining Barge. I noticed that I could make a tidy 1 million isk profit from a quick ore trade. As I need the money for the aforementioned Retriever, I bought 200,000 units, exhausting my funds. The route was only about 7 jumps, but it did go through low sec space (.4). I have traveled through .4 space before an never had any trouble. It was also early and not many people on. So I hit the autopilot on my Badger and was on my way. Begin foreboding music. As I jumped into low sec, I saw flashing red. Uh Oh. As I was in a Badger, there was really no escape, especially versus 3 of them. Before I could do much of anything, my ship was destroyed. A few seconds later, my pod joined it. I awoke in a station not too far away. Luckily my clone was up to date, so no skill point loss. So what happened? I had met my first gate camp and experienced my first podding. They did not want my cargo or a ransom. We were not at war, so I guess they were just bored. My badger was insured, although not fully. I was not carrying any cargo, so I really did not lose too much. My estimates are about 400k. As frustrating as this was, it was my fault. I could have avoided this situation without too much trouble if I was not complacent or lazy. Before purchasing the minerals, I should have inspected the route. 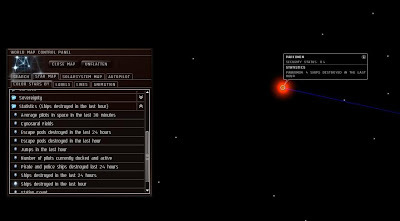 Using the map, I can display how many ships were destroyed in a system in the last hour. If I had checked that, I would have seen that something was going on in that system. So here I am with 250k isk in the bank and 4.4 million isk worth of goods on the other side of the gate camped system. I could wait it out, but I have things I need to do with that money. So I decided to run the blockade so I could go put in a sell order. After running my ideas past the fine folks at Eve University, I had my plan. Using a shuttle, I should be fast enough to get through the camp. There I sat on the safe side of the gate, pretty nervous for a video game. The key is to use Warp to 0 (zero), rather than the autopilot. It will allow me to get off the gate much quicker. So I jump. As soon as my ship materializes, I warp to the next gate. I could have only been visible for an instant. There was definitely some activity at the gate, but i did not stick around to watch. I had made it! Phew. I reached the station where my goods were stored and sold them. Luckily, I only had to take a very slight loss. On my way out, I ran the gate camp again without any trouble. I learned quite a bit, so hopefully I will not repeat those mistakes. with warp to zero, your never in danger in low sec flying a shuttle or inty. 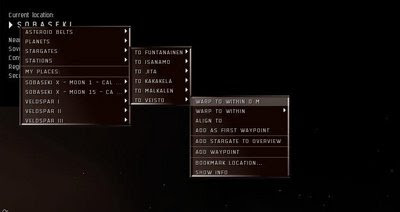 if you fly cargo regularly i would first (after checking map for activity)ask eve uni if there are any pilots nearby that can scout the gate for you. if there are none, grab a shuttle and check the gate for your self. if you can spare the low slots (you dont have too much to shift) i'd put some warp core stabs and nanos in your low slots. you should align to warp much quicker and you want get scrambled. also, always fit somesort of tank on your badger. can give give you valuable seconds. @Thal: Yea it was, not sure I can handle such stress from a video game. Warp to zero was my first thought too! Glad you learned your lesson with little to no loss. Not everyone is so lucky, I once lost half a bil in implants because I wanted to be lazy (high sec suicide ganks). You want to be really stressed out, I once flew my industrial (filled with candy if you get my drift ;) ) right into the middle of a warzone. Patients was the order of the day, and a nice T1 cloaking device. However, I was dual running accounts, so I was scouting myself.